​"The purpose of the Michigan Good Sam organization is to promote the use and enjoyment of recreational vehicles and outdoor fellowship among its members through trips and group activities". 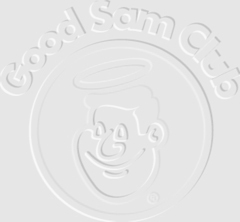 The Michigan Good Sam organization is part of the International Good Sam Club, which has organizations in every state in the USA as well as Canada. The primary organizational events for the Michigan Good Sam organization are two Rallys (formerly known as Samborees) that occur in July and September of each year. The Rallys typically begin on Thursday and continue until Sunday (however, "Early Bird" events begin on Wednesday night). These events are typically held at county fairgrounds somewhere in Michigan as we typically have over 100 RVs in attendance, and the fairgrounds are large enough to hold these events. As well, using fairgrounds allow us to keep the camping fees reasonable. The location of the event often changes from year to year. Within the state organization, there are many local "Chapters". Local chapters are a subset of the state organization, and consist of a few to dozens of members. Most members belong to one or more chapters, but there is no requirement to belong to one. While many chapters are organized in a geographical area, some chapters are state wide, including "Second Chance Sams" (those members that have survived a serious health issue), "Single Sams", and a chapter for members at large. See the Chapters page for a list of the current chapters within the Michigan Good Sam organization. In reality, Chapters (via Chapter Presidents) are the owner's of the Michigan Good Sam organization. For significant issues, members within a chapter vote on an issue, and the chapter president votes in the President's meetings typically held during the statewide Rallys. Many members also take in Rallys in other states throughout the year. Within the Ohio Valley region, there are at least 10 Rallys that you can attend. Good Sam members in a particular state chapter often caravan to other state's Rallys. So how do I join? Simple - just show up at a Rally with your RV. 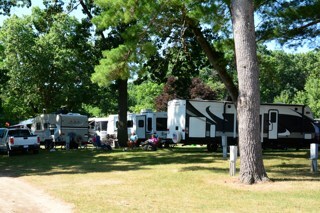 There are all sorts of RVs in attendance - from tent campers to 40ft motorhomes and everything in-between. A schedule of Michigan and surrounding state Rallys are published on the Rally page. You can download a pre-registration form from that page, or simply show up at the gate,where they will register you on the spot. The Rally page will show the location and date of the next event. Or, you can contact a chapter local to your area and ask the President of that chapter for information. They will be glad to help. 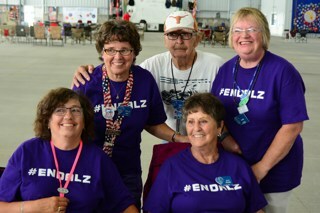 The Rallys typically consist of activities such as Bingo, games, working Puzzles, nightly entertainment, an Ice Cream Social, and Hospitality events. Sometimes a tour or golf outing will be scheduled, depending on the location. ​Click to view typical schedule. These are family events, and if enough young people are in attendance, events will be scheduled just for them. If you have never attended a Michigan Rally before, you will be a "First Timer", which is actually a position of honor. We will treat you well, and you will be invited to a First Timer event as well. Note that you do not have to be a Good Sam Member to attend a Rally. Local chapters extend the camping and fellowship experience, and it is typical for chapters to organize a campout in the months that the state organization does not hold a Rally. In effect, they are mini-Rallys. The venues for these campouts vary depending on the interest and location of the chapter. Other chapter-level events may include dinners as well as volunteer work on an organized level. As a whole, Good Sam members give back to the community. 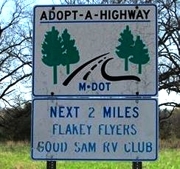 For example, one popular volunteer activity is Adopt-A-Highway.